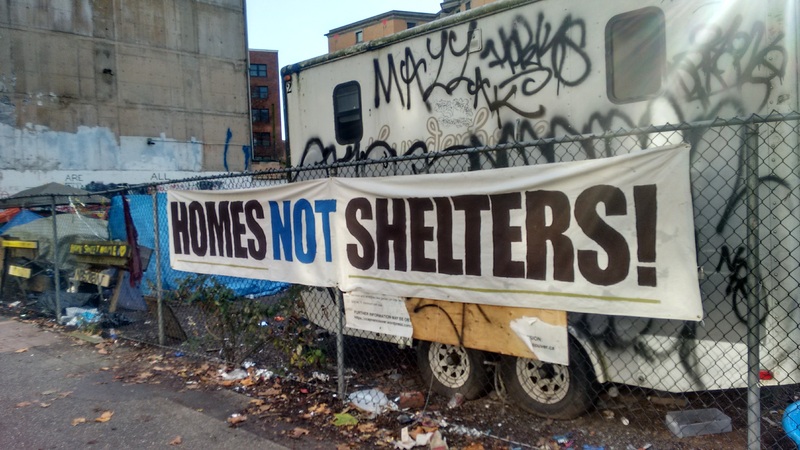 The injunction hearing for 58 West Hastings on the of morning, Monday November 14th, 2016, at the Supreme Court of BC will determine the future of the 58 West Hastings tent city. 58, as it’s called, was started on July 9th in response to the crisis of housing and homelessness for low-income people. And the Court ruling – whether or not it allows the City of Vancouver to displace the tent city with police force – will mark another battle of homeless people against anti-homeless laws in BC courts. Almost 20 people are currently staying at the site, with nowhere to go if the tent city is dismantled. They will be defended in court by the Pivot Legal Society. The affidavits that will be used in this hearing, in which residents testify to the desperate need for the camp (and for housing not shelters), are posted alongside this introduction in article form. These affidavits expose the misery of Mayor Gregor Robertson’s “ending street homelessness” shelter policies, the criminal inadequacy of SRO hotels and the rental housing shortage as a contributor to homelessness, and the reasons for tent cities in this climate of constant persecution and displacement of homeless people. The City’s main argument in favour of its injunction is that the site is unsafe for living. Yet at every turn since the creation of the tent city in July 2016, the City has been the main contributor to making the site less safe by refusing to collect garbage as they do at their other properties, and refusing to provide water and accessible toilets – a violation of basic UN requirements of sanitation and waste removal at temporary housing settlements. When I arrived on October 27th, one of the remaining couples on the site, Joyce and Cory, were distressed. Cory says that a Carnegie Outreach worker cut open their tent while they were away, and as a result the tent structure had collapsed and the tent was now flooded with rain. Joyce and Cory lost most of their belongings on this day and left the site the same day. Belongings abandoned by displaced residents is the pile of “garbage” that the city points to in their injunction application. But the city is also responsible for this. In the week following the City’s threat to charge homeless residents with trespassing, city workers refused to remove or store the waterlogged tents and garbage left by those who they were pressuring to leave camp. Joyce and Cory’s waterlogged tent was one of many tents left on the ground full of damp clothes and other belongings. In addition to refusing to clean up the garbage left behind, the City has even refused to provide garbage bags, garbage cans, gloves and other tools necessary to clean the site in a safe manner. Instead, City decisions have made matters worse. Just the day before the initial injunction hearing, the City took away the only portable toilet from the site, leaving the remaining tent city residents without access to a toilet. It should be pointed out that this toilet was not provided by the City, despite repeated pleas from tent city residents and advocates. Putting themselves at considerable risk, the remaining tent city residents decided to clean up the site by themselves. Together they hauled over two tons of garbage off the site, without any support from the City. But the City’s refusal to support the clean up effort has made lasting damage on the tent city, and when you google 58 W Hastings tent city today, the only photos that appear are of piles of garbage. The mess created by the city’s malignant neglect has fueled the hate of anti-homeless bigots and resulted in an atmosphere of hostility towards the remaining homeless residents. The City’s other central legal argument is that people have access to shelters. Yet as the affidavits of the tent city residents highlight, people are staying at the tent city because there are significant barriers to access that make it impossible for them to stay at homeless shelters. No one chooses to stay out in the rain, people stay at tent cities because they don’t have any other options and shelters are not an option. Some members of the community are unsafe at shelters and others, like the woman whose affidavit is anonymous, are not able to stay at the shelters because of their mental health. Some, like Joe are simply not able to access shelters because of work commitments, which means he is not able to make the shelter line-up on time. Finally, other people like Stacey and his partner Ilona have health issues that make it impossible for them to wait for hours for the shelter to open. They are also frequently prevented access to shelters because they are a couple, and most shelters do not accommodate couples. At the end of the day, even if everyone wanted to go to a shelter there is not enough shelter spots. Last year the City of Vancouver counted 1,847 homeless people, yet they only provided 1,308 shelter spots. This left 539 individuals completely unsheltered. And the homelessness crisis is only getting worse. Last year the UGM turned 1,545 people away in the first nine months of 2016, up from 1,251 during the same period last year. This means that even if you are able to secure a bed for one night, there are no guarantees you will have it tomorrow. Shelters do not provide stability or safety, and they should never be considered by the government as an alternative to housing. Being homeless is always unsafe, but the tent city has provided a sense of safety and stability that is not possible to achieve in solitary homelessness. The stories of Joe, Stacey, Rob, Ilona and the other remaining residents of 58 W Hastings highlight that if the tent city is dismantled, they will be less safe. They will be displaced, dispersed, isolated, criminalized and at higher risk of being victims of violence. It also means, for people who use drugs, an exponentially higher risk of dying from an overdose because they will not be near proven lifesaving help of their tent city community. The City of Vancouver will slander the homeless by focusing on the garbage and violent assaults on the site, but they will not mention how many lives have been saved. Nor will they pay homage to the improvement of people’s health and wellbeing as a result of simply being able to sleep. These are findings that have been solidified in court decisions, most recently in Victoria, but the City will cover up these benefits in order to justify the displacement of the camp by police force. The City’s injunction is designed to break up and destroy the little stability, safety and security that the homeless residents of 58 W Hastings have built up over the past months. If the court awards them their injunction the message will be that private property rights and the homeless-free appearance of Vancouver’s downtown core is more important than homeless people’s lives. And the message would be clear: homelessness is a crime in the City of Vancouver.